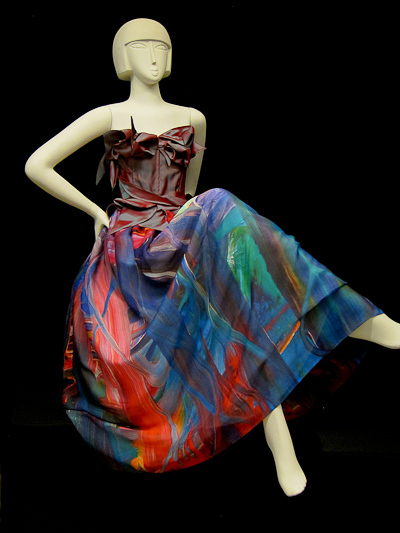 I am so excited to have been invited by Pamela Ptak, a gifted Couture Dress Designer, to collaborate with her on a gown for a most unusual fashion show called ‘Frock & Roll’ to be held at The Baum School of Art in Allentown, PA, February 9th – March 2nd 2012. Pamela came to see one of our Fall Renaissance shows and after hearing our song called ‘The Mystic and The Muse’felt inspired to create a gown. When she called me about this, it was the perfect opportunity to discuss the possibility of printing a painting (in this case ‘The Muse’) onto fabric and taking it that one step further. Since I started painting I have visualised ‘wearing’ my art while singing, now this has become a reality thanks to Pamela and artist/dress designer Ileanna Olympia who so graciously shared her expertise for printing original art onto silk. They have made my dream come true. My painting ‘The Muse’ is now expressed in silk, and with the magical expert hands of Pamela has become a masterpiece. The opening night is open to the public and the ‘meet and greet’ is also but involves an entrance fee. I would be so happy if you can join me at these two special events. Please check out the poster for more information about the school and the fabulous designers/artists participating..
Posted February 5th, 2012 in News.